We've just been to the Rare Disease Day event at gothic looking Royal Holloway University in Surrey. 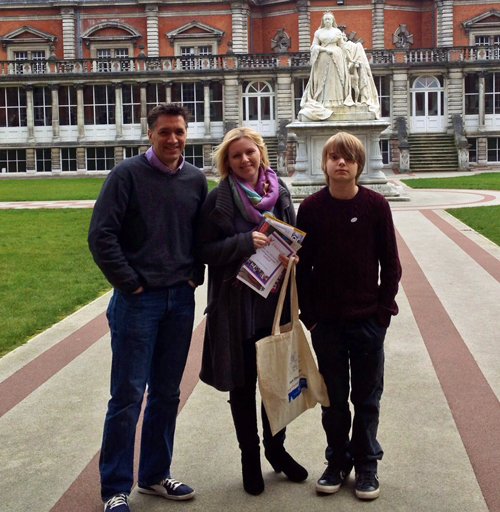 The boys were given the day off school and we headed out en famille, including Mr T (no, not that one). We first took part in a discussion led by the Genes for Jeans/ Genetic Disorders charity about living with rare diseases such as neurofibromatosis and Huntingdon's Disease. There were a number of GCSE students there, including my boys, who were asked to ponder the question of whether they would undergo genetic testing if a positive result meant that they would discover that at the age of around 30, they would succumb to a devastating illness and early death. Most decided they would rather not know, but that if they did they would try to live their life to the fullest. In fact statistics show that only 10% of those with a high genetic probability of Huntingdon's choose to be tested at age 18. 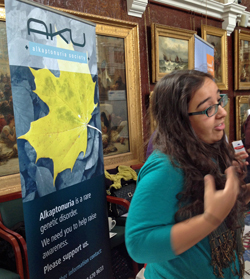 In the large picture gallery, rare disease charities had exhibition stands set up from Shine charity (Hydrocephalus/Spina Bifida), Tuberous Sclerosis, AKU, Myasthenia Gravis and Ehlers Danlos Syndrome among others and there were hands-on activities for learning about DNA and the genetics behind rare diseases. We were especially interested in the EDS stand as Son2 is affected by this and I have also just been referred to the same specialist. 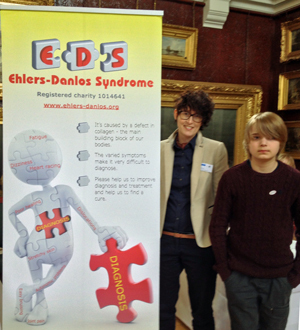 Son2 was delighted to get an EDS lapel badge and pose for a photo with Lara from Ehlers Danlos Support UK. I had a really interesting discussion with the team from the Alkaptonuria Society and the important research work that's being carried out to try to find a cure. The condition can cause severe pain, osteoarthritis and heart disease. One really surprising discovery was that after almost 20 years, the message that Folic Acid can prevent spina bifida is still not common knowledge among women planning a baby. This is, apparently, because the main campaign was around the time when I was having my babies who are now 15 and 13, but awareness has faded. Another fact is that it is now known that women need to be taking Folic Acid three months BEFORE they become pregnant for prevention - it's too late once the mother to be is already pregnant. The Shine charity is trying to change this lack of knowledge. The thing about rare diseases is that millions of people have them but there are many, many different conditions and the vast majority suffer from lack of investment in research and medicines. 75% of rare diseases affect children and 30% of rare disease patients will die before their 5th birthday. There are over 6,000 recognised rare diseases. There are a number of people in my life who have various kinds of rare diseases. The youngest, my nephew Dylan, is just 4 years old. There are also many wonderful people working to help people affected by rare diseases in the form of volunteers, charity workers for specific rare conditions, researchers, scientists and people working for rare disease organisations such as EURORDIS, Rare Disease UK and NORD. There is much work being done and it's to be hoped that world-wide events like Rare Disease Day will help to raise awareness and bring in investment to help improve or save the lives of those affected by little-known conditions. If you're looking for support for a rare disease, check out RareConnect, a multi-lingual forum that has more than 30 rare disease communities - maybe your condition is one of them. If not, why not start one?